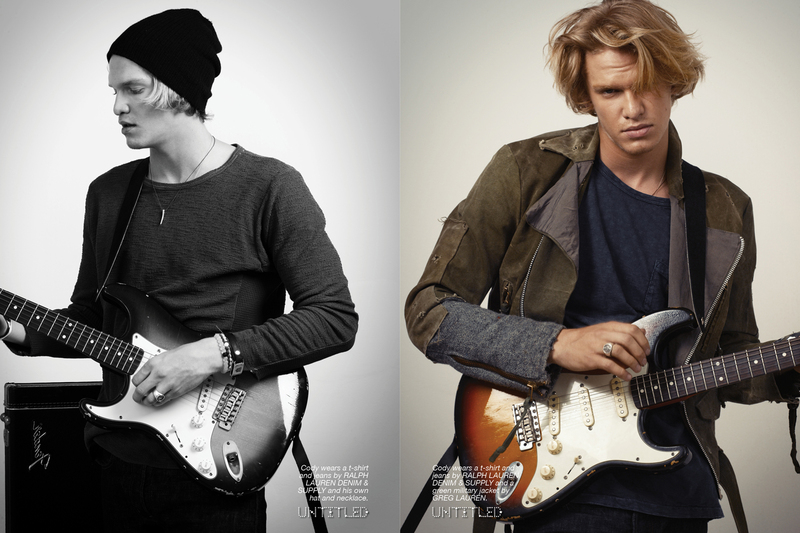 Cody Simpson photographed by Indira Cesarine for The Untitled Magazine. Cody wears a shirt and jeans by RALPH LAUREN DENIM & SUPPLY with a vintage motorcycle jacket and his own jewelry. 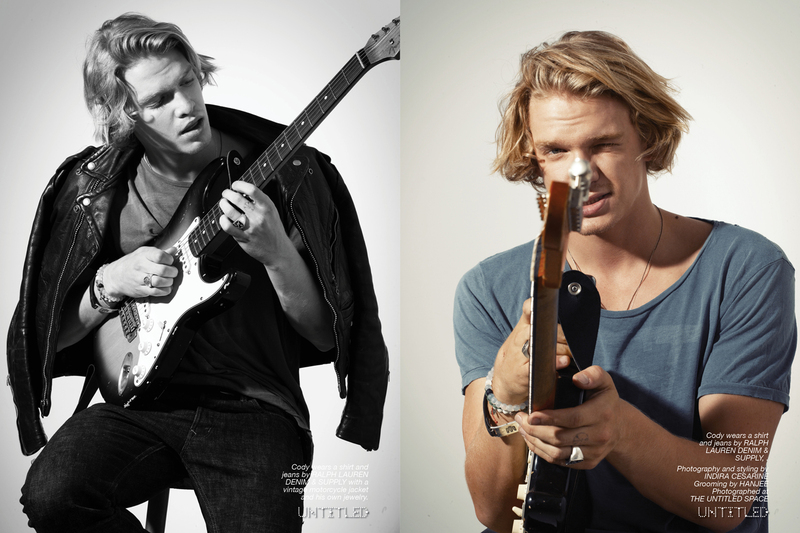 The Untitled Magazine thought it was time to catch up with Australian singer-songwriter, Cody Simpson, who is riding a high wave after the successful 2015 release of his album FREE which he released a on his own label, Coast House Records. The album, produced by Cisco Adler, included hits such as “New Problems,” “Living Easy,” and “Flower,” which featured album cover art by none other than Miley Cyrus. FREE left its mark on the scene and solidified Cody’s status as a serious music maverick. When he’s not busy launching his own record label, dating supermodels (did someone say Gigi Hadid? ), and being the face of Ralph Lauren’s Denim & Supply, he finds time to write poetry, read philosophy, and devotes himself to global causes. Last year, for World Humanitarian Day, he partnered with the United Nations for the #ShareHumanity campaign, which makes us love him all the more. Lately he’s been back in the studio working on his new album as well as hitting international stages including making a surprise appearance with DVBBS at Miami Music Week, jumping on stage with Rick Springfield for an iHeart80s party, and jamming with his new band, Coast House. We are looking forward to hearing more from this rock poet, and so will you after reading this candid interview! Left Page: Cody wears a t-shirt and jeans by RALPH LAUREN DENIM & SUPPLY and his own hat and necklace. 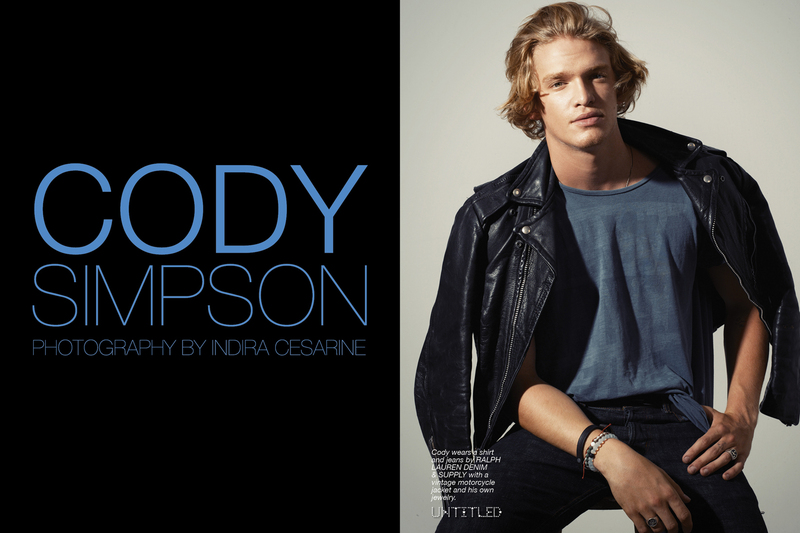 Right Page: Cody wears a t-shirt and jeans by RALPH LAUREN DENIM & SUPPLY and a green military jacket by GREG LAUREN. Indira Cesarine: Can you tell me about what it was like to grow up on the Gold Coast of Australia? Cody Simpson: The place where I grew up was very beautiful. It’s almost like I chose to be from there. I was very fortunate to be born in such a great place to such giving, generous, and supportive parents. It was a very mellow kind of childhood. I was highly occupied by school and I was actually a competitive swimmer until I was fourteen years old, so that was kind of where my head was at. That is where my vision was for my life. Music was just a hobby, a very minor thing. It was something that I did during lunch time at school. I would be in the music room recording little things, just for a good time. I never thought that anything was going to happen out of it. If I had any plans, it was to pursue music later on in life. But, opportunities came and I had to ride the journey. IC: What were some of your early musical influences? CS: The very first stuff I was listening to was country. It was the first kind of music that I was exposed to. Actually, it was the only music genre that I was exposed to until I was about twelve or thirteen. The first live music gig I went to when I was about 10 years old was Tommy Emmanuel, who’s an acoustic guitarist. The next year was Keith Urban, who’s a famous Australian country singer. At home, it was Johnny Cash, John Denver, and a bit of Elvis. IC: That’s so interesting. Is country a really big thing in Australia? CS: Yeah, I’d say so. I mean, just as much as it is anywhere. I think country and blues and those genres are kind of the basis of everything. Obviously, country and blues started in the states. It just happens that a lot of the grandparents of this generation’s musicians are big country fans and that kind of dropped down, subconsciously, through the years. I didn’t really hear any kind of popular music until I was twelve or thirteen years old. That’s when you sort of become aware of popular artists of the time, like Justin Timberlake or artists like that. People who are dominating popular music. It kind of starts to seep in because you start to pay attention to the music video channels and as you grow older, year by year, you become more culturally and socially aware of things. So that’s when those influences started to creep in. IC: I understand that back in 2009, you started posting the performances that you recorded in your bedroom online to YouTube? CS: Yes. I had a band at school, so that was where I started writing my songs. It was me and my buddy playing guitar. It was two guitars and a drummer, it was pretty funny. I would write all the songs for us and we would play at the end of semester school concerts, some kids would get up and do their spoken word prose or poetry and bands would play. We would get up and play, and that was where I first started to write my songs and began to develop the ability to put guitar cords to lyrical compositions. Before then, I was just writing songs about the crush I had on a chick at that time or what was happening in the rugby national competitions, just really random things that I was exposed to. A lot of that stuff had a Jack Johnson feel, he was kind of the biggest thing at the time in my hometown. It was surf-folk, so that was the kind of stuff I’ve been writing since I was a kid. 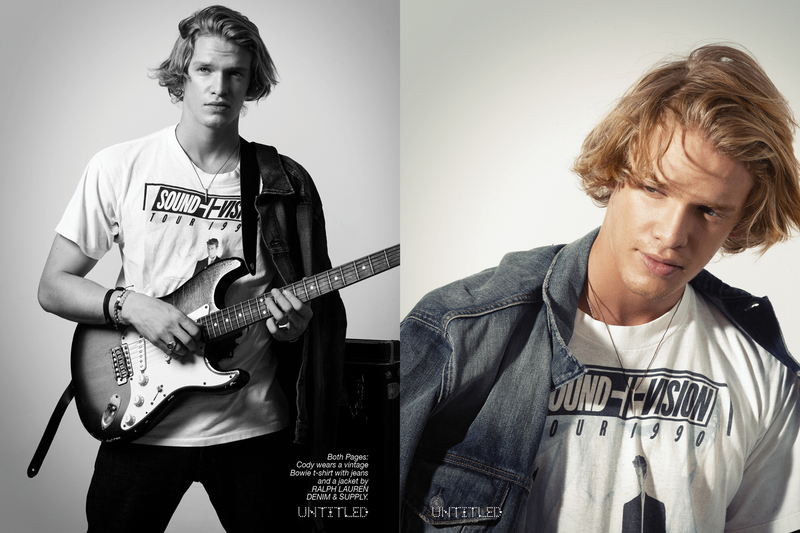 Both Pages: Cody wears a vintage Bowie t-shirt with jeans and a jacket by RALPH LAUREN DENIM & SUPPLY. IC: Your work is really poetic. Can you tell me a little bit about where you get your inspiration when you’re writing? CS: Thank you for asking me this question because I’ve just delved very deeply back into poetry. Ever since I can remember, I’ve been writing rhymes, stories, poems, and that kind of thing. I would enter my poems into the school contests, it was called Pegasus Writing Competitions or something. Every year, I would get 2nd or 3rd place for my grade for the little poems and stories I would write. When I started playing guitar more seriously I was like, “Hang on a second, I can actually sing these with melodies and make songs out of them.” That was when I started my band at school. So after that, I kind of stopped writing, surprisingly, when I actually got picked up over here in the states. I put a couple of songs that I did at a local recording studio on Myspace and a producer listened. One song was called, “Ride My Roller Coaster.” Now when I think about it, it’s kind of a sexual innuendo to be talking about at that time when I was twelve. After that, I stopped writing as much. When I came over here, I got really overwhelmed by all of these people that wanted to write with me and for me, so that’s when I started making pop music for the next couple of years. It’s taken until last year to come back around and uncover all of those layers that were thrown over me and connect back with my roots. It’s been nice to chill out and write again. It almost feels like I’m twelve years old again. IC: You have quite a variety of different songs that you’ve written. Is it love, life in general, or what exactly that inspires your writing? CS: At the moment, it’s much more life. I’m not all that inspired by the concept of love, women, or anything of that type. Probably because it’s not necessarily present in my life at the moment. I’m definitely more inspired by the concept of growing up and developing your own personal ideologies, philosophies, and perspectives on things. It even goes all the way down to political views or things like that. They’re always best to write about. It’s the age that I’m at now, when you start to develop your self awareness and your consciousness. It can be a scary thing and it’s been a strange kind of a growth period for me. You start to become aware and to to realize “I’m a human being in this existence, in this world.” It’s almost like a minor modern existential crisis and that inspires your work a lot too, for me at least. IC: I’m guessing that you are single at the moment if love is not inspiring you? CS: Yes, I’m single. I’m going through that phase where I’m taking time for myself. I think you have to take the time to grow as a human being before you can dedicate yourself to somebody else. For true love to happen, it has to be shared between two whole human beings. If somebody is not complete and is looking for someone else to complete them, I think that’s when you have the codependency issues and the kind of reliance that becomes unhealthy. That’s what happened in my past relationship because it was very young and undeveloped. IC: A lot of people see it as sort of romantic to “complete somebody,” but like you said, it’s not necessarily healthy. CS: It’s almost like an illusion because, you do feel completed. After a while, you realize that you have to know who you are to be able to give to somebody else. I’m reading a book at the moment, called Letters to a Young Poet. Have you heard of it? IC: Yes of course. It’s a very well known book. CS: A friend of mine gave it to me. It’s about being with yourself at your most quiet hours, and realizing that you’re at the bottom of everything. You are solitary. You have to learn how to be with that solitude and in that solitude. That’s something I’m working on at the moment. It’s really helping my writing too. Left Page: Cody wears a shirt and jeans by RALPH LAUREN DENIM & SUPPLY with a vintage motorcycle jacket and his own jewelry. Right Page: Cody wears a shirt and jeans by RALPH LAUREN DENIM & SUPPLY. IC: So last year, you released your album, Free, which did very well. You did it on your own record label, which was a very brave thing to do. Can you tell me a little bit about your impetus to release it on your own label as well as some of the highlights of that particular album? CS: I’d love to talk about this. Coast House Records has kind of coincided with my coming of age. Leaving my label was a big step for me. It had been almost like a home for me from the time I was fourteen up until seventeen and a half. I explained to them that I needed a change and to go out on my own and find myself out. It definitely coincided with my coming of age and independence, where I moved out of my parents house and all those kinds of things too. When I worked on Free, it was that initial development of personal understanding. I really stripped it right back to my roots and wrote music like I used to. It was really nice to do it all in Malibu. When I moved to Venice, I would just drive to Malibu every day, and work with my producer, Cisco, who we did the whole record with. It was just really nice to get that out of me because I had grown up with this kind of music. I actually worked on it with a couple of people I had grown up listening to. People like Donavon Frankenreiter and these guys that would always come down to the Gold Coast for surf competitions and play gigs. We would go and watch them and have backyard BBQ sessions and that kind of thing. It was just such an amazing feeling when you have something that’s so ingrained inside of you. You have to bring it out for a project and that was how it was for me. It was really going back to my home, core roots, and getting that record out of me. It was really nice. Now, I’m developing Coast House as a label and as a lifestyle kind of brand. I’m in the studio over the next couple months working on some new stuff, which has been really great. I’m also practicing a lot of guitar and becoming an improved player and singer and everything. I’m really excited. IC: I know that you were just at Miami Music Week, where you did a performance. I see that you’ve also posted on social media a couple performances you have coming up. Can you fill me in on what we have to look forward to with you? CS: I’m in the studio over the next couple of months, experimenting at the moment. I’ve also put a band together and we’re writing a lot of music. IC: Is that Cody Simpson and Coast House Band? CS: Yes. I’ve been playing a lot of Blues recently, which has been fun. We’re actually playing at the Malibu Guitar Festival next month. Aside from that, I’m working on the new album, which I’m very excited about. It’s kind of going to be a great step from where I was on the last one. I think it’s probably going to be something that people are really going to be able to see a lot of growth in my artistic process, and my skill set as a musician. I’m looking to get some stuff out by the summer time, so I guess that will dictate what happens from there. I’m also just doing a lot of writing. I’m putting together a collection of poetry that hopefully I’ll be able to share at some point soon. Aside from all that, I’m just being nineteen. Enjoying life, partying, not taking things too seriously. It’s important to stay connected to the child in you as all this stuff goes on around you.